work-appearance Presented at: rca2018_research culture in architecture, international conference on cross-disciplinary collaboration, Kaiserslautern, Germany. Video and oral presentation. Dance with Space – animate-configuring is an initial sketch in the Space_Gesture work-in-progress series. 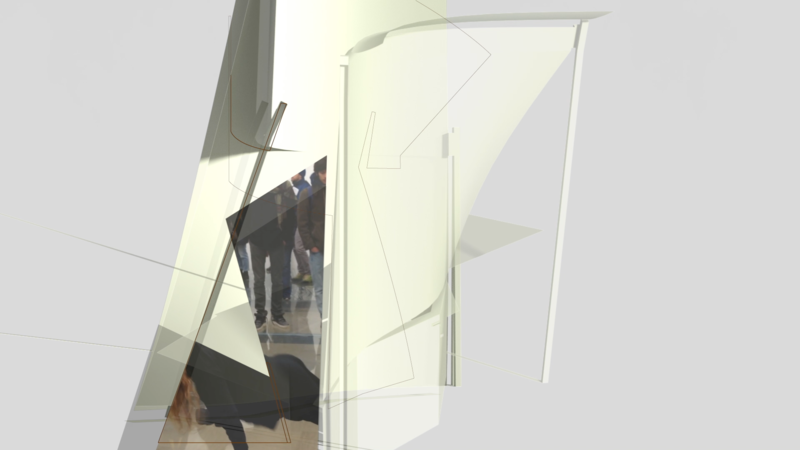 The work initiates experiment with interactions between virtual image and physical body, combining video-appearance with viewer-gestured articulations; prepared for use with AR. The term dance-with-space refers to concepts of catalyzing participants into virtual dancers, making them partly recognize the moves of others and partly ‘ignore’ natural or functional movements – as a mean to open up sensation and experience of the art-of-shared-space. The work set up simple situations of to ‘dance-with’. That is, to confront spectators with modes of drawing and plastic assemblies of different entities and visual angles in a 3D-model, rhythmically animated as a kind of dancing-partners. The term animate-configuring refers to animation of movements – viz to render movement visible with animation as a ‘how can movement’s potential alter forces of form’. The sketch is worked-out as video. The video presents initial body movement- and surface exchanges, followed by possible AR-triggers. Triggers come forward as intruding ‘other’ bodies that may incite viewer-gestured moves of fractions of the 3D-model, and by that will twist interval and atmosphere to interchanging imaginations and articulations.